I'm an Author not a Writer! : Award time! Since I hadn't checked my blog in so long I didn't realize I had received two lovely awards. 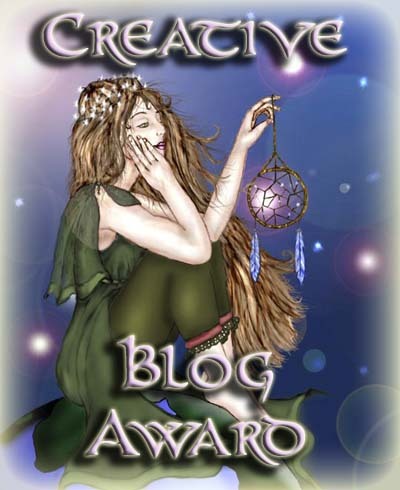 My sincerest and deepest thanks go to both Deirdra-Eden Coppel and A.M. Supinger for giving me the CREATIVE BLOG AWARD and VERSATILE BLOGGER AWARD respectively. As part of accepting the VERSATILE BLOGGER AWARD I need to share seven things about myself as well as pass this award to five newly discovered bloggers. So let's get the personal stuff out of the way. I've hiked along the continental divide. I've had my palm read in Thailand. I watched the Hale-Bopp Comet grace the night sky. In 1999 I didn't party like it was 1999. Books I've read more than once: The Last Unicorn and Stars My Destination. I slept through a Category 5 hurricane. I've been to (or at least passed through) every state of the Eastern Seaboard.